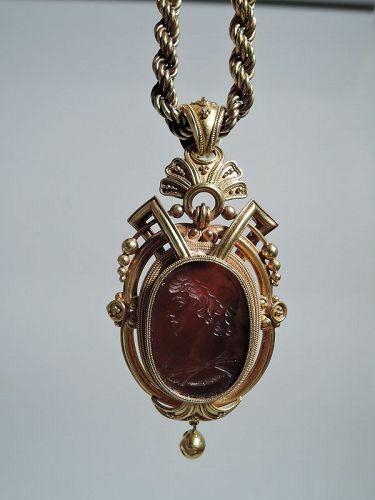 Antique 18K gold Etruscan Revival pendant with fine agate intaglio. Intaglio with beautifully carved left-facing Classical man set in fancy pendant with strapwork, rope, and beads, including drop bead. Stylized leaf has loose-mounted bail threaded with rope chain. Pendant back clear glass. Lots of charm. Italy, ca 1880. Fine condition with rich patina. 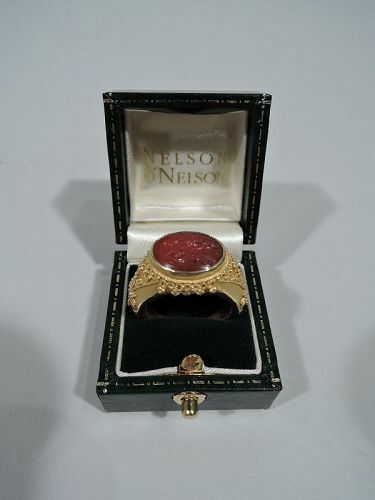 Fabulous Etruscan Revival 18k gold ring with delicate filigree and ancient carnelian intaglio. Intaglio has carved depiction of Athena, the goddess of wisdom, with helmet and shield. A fine gift that packs symbolic wallop. Exceptional craftsmanship. Italy, ca 1890. Fine condition with lovely patina. 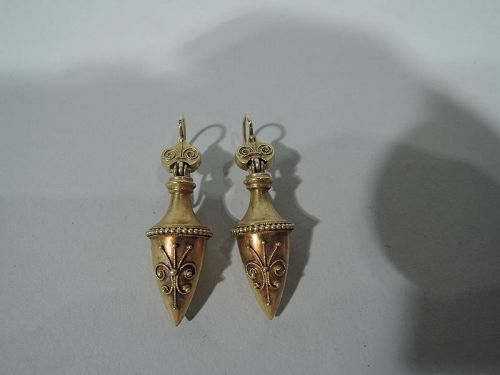 Charming pair of Etruscan Revival 15k gold earrings. Each: Conical urn with domed top. Beading. Filigree volute scrolls on urn and bail. England, ca 1880. Very good condition with rich patina. 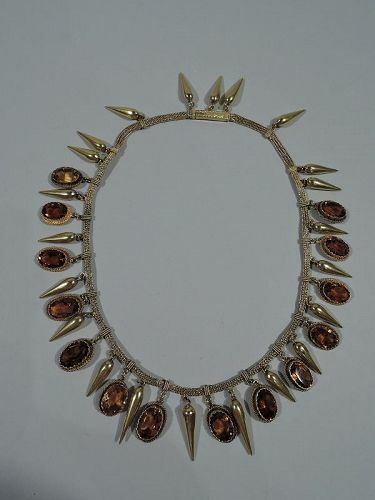 Etruscan Revival 18K gold and citrine necklace, ca 1870. Fringe-style with egg-and-dart pendants in form of alternating collet-set citrines and gold. A beautiful example of the archaeological vogue. Signed MB in lozenge and French hallmark on clasp tongue. Very good condition with a few minor age-related imperfections.